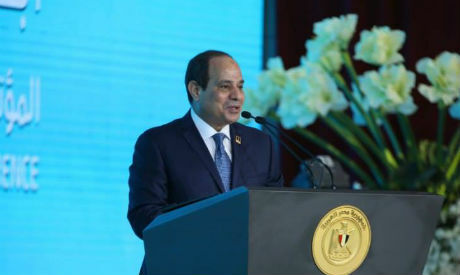 Egypt’s President Abdel-Fattah El-Sisi opened on Wednesday the fifth youth forum in Cairo with wide participation from political figures and parties, civil society groups and youth representatives. The president said in his opening speech that the conference presents an opportunity for dialogue for the sake of Egypt. El-Sisi stressed the need to talk, listen and understand a number of issues in order to continue the process of building the Egyptian state. The conference's agenda comprises three sessions. The first session is titled "The Youth's Vision for the Egyptian Political Scene," includes a discussion among youth representatives on challenges and prospects for the participation of youth in political life, and the future of political parties in the country. The second session - "The Vision of the Egyptian State for the Upcoming Four Years' - will include an analysis of the latest presidential elections.